The wind had slammed into the old Gothic Revival all evening. Camille Hastings shivered from a draft from which she couldn’t escape. She zipped up her velour hoodie. Her grandmother had been taken in for observation and Camille had offered to take care of her pets. While watching old horror movies, one of her three cats darted by. The cable went dead and she turned off the static. A scraping sound came from behind. She sprang from the Victorian sofa and gazed around the antique laden parlor. 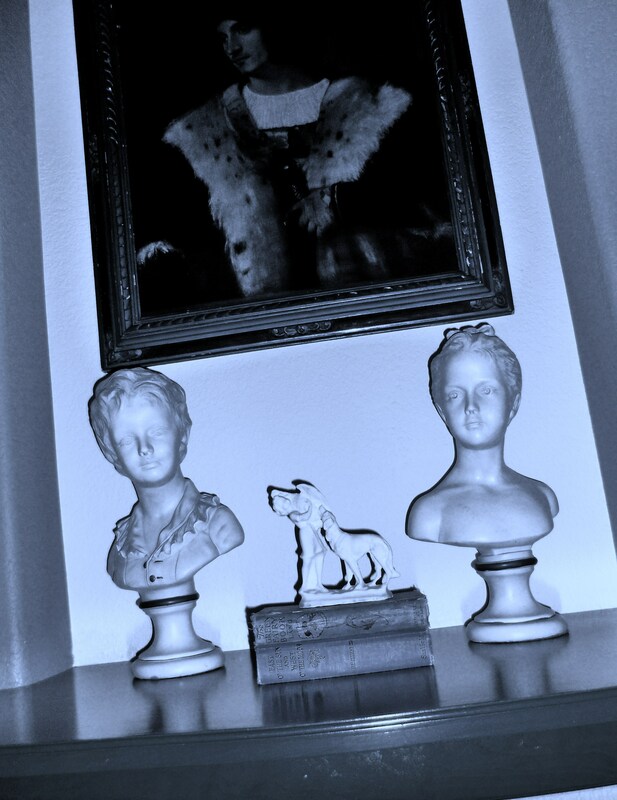 The blank dull eyes of a pair of statues seemed to glare at her from the top of a table. She crossed the room and every hair on her body stood erect. She spun around to look at the porcelain busts and her gut clenched. Their eyes seemed to narrow as their grins grew broad. She switched off the lights and walked through the dining room into the kitchen. I’m imagining things. While reaching for a glass from the cabinet, the overhead light flickered and a dark shadowy figure streaked by. “What the Hell?” She grabbed a knife from the drawer and searched the house. The three cats stretched out on the couch without concern. She climbed the stairs to the bedroom where she slid under the cold comforter and drifted off to sleep. Camille awoke to footsteps. Her heart pounded. The glimmer of fading moonlight peaked between the curtains. Her eyes scanned the room, but no one was there. She glanced over at the bedside table. The carving knife glinted in the pale shaft of light. The alarm clock read 5:47. When Camille sat up to stretch, she let out a blood-curdling scream. The sibling statues stared at her with twin maniacal grins from the dresser at the foot of her bed. She shook her head and thought, I hope James and Judith leave Camille alone. When was the last time you were truly frightened? Flash Fiction in 3 – 100 word chapters – The Halloween Friday Fright-fest continues! Now that is truly creepy. Yikes! Good job. I enjoyed your creepy story. I do hope the twins left Camille alone, but I still wonder. They must be dangerous (possibly?) if Camille’s grandmother expressed concern. I expect that Camille shot out of the house and never returned! Hahaha! I think Camille will spring grandma from the hospital and a for sale sign will soon go up on the house. Hahaha! Like this story a lot. Very Ramsey Campbell-esque! Thanks Jon! I will have to look up Ramsey Campbell. I have enjoyed going through those creepy videos…..
Creepy – and I am now cleaning off that knick-knack shelf. Thanks Lecia! I haven’t really been around cats very much, but I can imagine they do! Thank you Madison and for hosting! I can see how you thought that! It reminds me of an old show Night Gallery! Thanks for stopping to read Tiyana! Just one more reason for me to use that boat, right? Great story. Would have been no sleeping by me in that house. Seriously! Hahaha! Thanks for subscribing Doug!! Welcome aboard! Yes I wrote it so the grand daughter experienced the same thing. I would have written that the grandmother would have been released and would have moved out of the house. I had computer problems or I would have been back sooner! Thank you for getting me in the Halloween Spirit. Halloween is by far my favorite Holiday, but I have been too busy to notice this year. Around the town where I live all of the Dia De Los Muertos aters are going up, it is marvelous. Oh I bet they are marvelous!! I actually have a couple of glass front cabinets I picked up at an estate sale long ago. I should get them out. My kids made the sugar skulls in middle school! I still have them too!! Thanks for the reminder and for stopping by to read! I might offer one light edit in the first paragraph, deleting the second “she” in the second sentence, because we already know who’s doing the action. But… I just need to say that I actually woke up once around 3 in the morning when a relative of mine had accidentally walked through my room without realizing I was asleep there and absolutely terrified me. I think you captured that feeling beautifully in the last paragraph when you described her waking up, heart pounding and scanning the room. As always, love the three part style. Thank you for writing! Goodness, this is really spookie. I love it — right in time for Halloween! Thank you so much Angela! I have a few more of them to post in October…..
Errrr, fast fingers. I meant, “spooky”, ha,ha! I guess, I was totally spooked out by this story! I never even noticed! LOL! Ooh! That really scared me. You write so well! Creepy, and convincing! Thank you for the reading. Thanks for stopping by Norv! I hope you will stop in again soon.